I didn’t seem to have to do any repairs! This year represents an important milestone for Farmer & Carlisle Toyota as we celebrate our 40th Anniversary. To mark this special occasion we are celebrating by talking to customers that have supported us from the beginning. Paul Willams has bought 12 vehicles from the same dealer – Farmer & Carlisle Toyota Loughborough since 1983. Mr Williams bought his first Toyota - a Corolla - from Mike Farmer and sales executive Ian Hall back in 1983. Ian is now Sales Director at Farmer & Carlisle Toyota Loughborough and has sold every one of the 12 Toyotas to Paul. When asked why Paul had remained such a devoted ambassador for Toyota Paul said, “what I really liked was my meeting with Mike Famer and Ian Hall and I think just the rapport with the people and the trust that I got. It’s a combination of the product and the relationships with people. Those are probably the two things that have kept me with Farmer & Carlisle all the way along”. 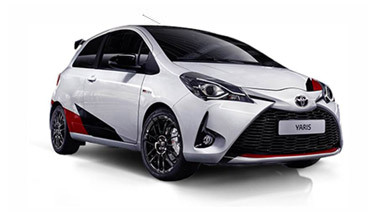 Not only did Paul fall in love with Toyota but he spread the joy throughout his family, he goes on to tell us “several of my family have bought Toyotas as a result, my parents for example have just switched to Toyotas, my dad eventually, he had a Yaris. In fact what actually happened was we got a new corolla, passed the old one onto him which was his first corolla and then he went on and got another corolla and then after that he got a Yaris, then after that he had to stop driving because of age and so he handed his Yaris to my wife, who handed the corolla onto my daughter, so we hand them around in the family”.